Dr. Pasha is an educator, scholar, mentor, organizer and community leader of exceptional talent, training and experience. His background combines authentic Islamic education and training with a Ph.D. from one of the premier research universities in the West. His lectures, seminars, camps-community clean-up and other programs and activities provide extraordinary training, education and motivation in Islam and in life in general. His way of teaching is unique, personal and powerful. It combines time-honoured Islamic sciences and traditions with contemporary Western scholarship and knowledge in a way that is all his own. Dr. Pasha’s treatment of Islamic subjects is 21st Century to the core. Dr. Pasha is the author of a highly effective method for teaching the Qur’an to English speakers that has been successfully used in the West for upward of 30 years. Dr. Pasha is also a highly incisive and insightful social and Islamic thinker and a dynamic and thoughtful speaker in several languages. His ideas on how Muslims must understand and apply Islam in the West in the 21st Century are among the most challenging in today’s troubled world. They have been at the cutting edge of Islamic thought in the West for the past three decades. During much of this time, Dr. Pasha has been a vocal advocate of Muslims reaching out to their non-Muslim neighbours in the West with the teachings of Islam and with the message of love, service and neighbourliness that he says Islam embodies. For the past several decades, Dr. Pasha has been calling on Muslims in the West to wake up to their civic, social and moral responsibilities in their respective Western societies and homes in the true Islamic spirit of citizen participation. Son of a long and distinguished family line on both his father’s and mother’s side, Dr. Pasha is a strong believer in the message and methodology of his ancestors to be of service to people, Muslim as well as non-Muslim. “The question – and the choice – before Muslims in the West, and everywhere else, today, as always, is quite clear: It is to reach out or not to reach out. It is that simple!” (Dr. Pasha). “Dr. Pasha is not a Qadiani or Ahmadi or Bahai. He is a Muslim from the Ahl Sunnat tradition. 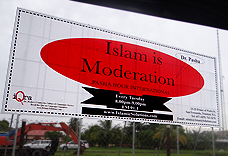 Dr. Pasha is one of the most senior people associated with Islam and Islamic work in the West in general and in the United States and Caribbean in particular. It is fair to say that Dr. Pasha is among the pioneering leaders who, in its earliest days, worked tirelessly to build the MSA in the US and Canada. The Website www.IslamicSolutions.Com contains a wealth of writings by Dr. Pasha which, to say the least, are among the most authentic, unique and powerful one can find anywhere in the world. This is in addition to a large number of audio tapes of his weekly radio program Pasha Hour International: Live From America! as well as a vast collection of his Qur’an Programs conducted on both sides of the Atlantic. As you can tell, Dr. Pasha has been a pioneer and a trend setter in many of these areas in this part of the world for a long time now. Even though he would himself be hesitant to say this, but it is self-evident that Dr. Pasha, among other things, is an expert in Arabic Language, and in several other languages, and in the Qur’an and the Hadith. Dr. Pasha’s research and scholarship on the Qur’an are nothing short of groundbreaking. Frankly, they may even be considered revolutionary. Evidently, God Almighty has blessed Dr. Pasha with the extraordinary ability to bring the Qur’an alive to his audiences during his Qur’an Programs. Though a qualified and competent Mufassir (interpreter or commentator) of the Qur’an in his own right, Dr. Pasha has walked away from his practice of giving Tafsir to the next stage of making the audience, regardless of their age, education or gender, see the meaning and miracles of the Aayats of the Qur’an with their own eyes. Dr. Pasha is the originator of the method of Arabic-English Word-by-Word Qur’an Program, which has made the Qur’an accessible to countless men, women and children on both sides of the Atlantic Ocean. For the longest time, Dr. Pasha also worked with non-Muslims and new Muslim converts in a number of settings and societies. A long time ago, realizing the pressing need for it, Dr. Pasha wrote a pamphlet with the title: You Must Know This Man! That pamphlet was quite likely the first of its kind in the world. And it is now translated in perhaps no less than 50 different languages around the world. In addition to all this, Dr. Pasha also is a University Professor in the fields of journalism, public relations and communication. Dr. Pasha’s model on Minority Integration in Europe that Dr. Pasha presented at a professional conference more than a decade ago remains valid and relevant for European powers to use in dealing with their present Refugee Crisis. In articulating that model, Dr. Pasha had successfully predicted the present Refugee Crisis and urged the European governments to wake up to the challenge before it got out of hand.